Over the past 4 years, we studied multiple projects involving the use of digital signages. We compiled our findings, and present a series of mini case studies of what worked (and what didn't). Based on these observations, we make a few predictions on the future of digital signage games. What is a digital signage game? It is a game operating inside of a digital signage device. These devices are placed in various outdoor and indoor locations, such as bus stops, train stations, waiting areas, exhibition booths, taxis and more. The consumer (or user) interacts with the game via a variety of interfaces, such as touch, voice, movement, or via their smartphones or tablets. These games are typically designed with a few goals in mind. First and foremost, digital signage games provide a form of bite-sized entertainment. These may last anywhere from 5 seconds to 5 minutes. It depends a lot on where the digital signage is located, and a guesstimate of how much time a consumer has before moving onto something else. The second goal is to promote a brand or message. When the consumer receives something entertaining in return for their actions, there is a window of opportunity for brands to	emotionally connect with the consumer. Hence, consumers can be shown a certain marketing message which potentially can drive more exposure and follow up actions. What kind of technology does it run on? Digital signages run on different types of technologies. Some screens are essentially a large screen Windows computer built inside of a frame with a power source. Some run as Android tablet apps and iPad apps. How do casual games fit in? Traditionally, signages were static, physical boards with messages imprinted on them. With the introduction of digital signages in the late 70s, brands could customize messages on digital signages without replacing the devices themselves. With the internet and the advancement of LCD/LED displays, deploying and managing digital signage content is getting extremely easy. The next step in the evolution is obvious - it's interactivity. We think consumers should be able to interact with digital signages. The best way to encourage consumers to interact, is to provide a fun experience. By definition, a fun experience almost always relates to a casual game. As you read further, we shall introduce a few mini case studies of how brands leverage games in digital signages. These involve very recognizable brands with large audiences. Toyota sponsored the annual NHRA Drag Racing event, where heavily modified cars race each other for fun and glory. It's an event where people come from all around the US to meet and talk about modified cars. To promote the Toyota brand, a digital signage game was installed in a Toyoto exhibition booth. Booth visitors can walk up to the large screen, pick up a tablet and race digitally against another player. Before the race begins, players get to enter their name, email address and phone number to win a prize. Next, players choose the model of the Toyota-branded car they want. The gameplay consists of both players trying to tap faster than the other. The faster player sees her car advancing past the finish line. On the sales and marketing side, Toyoto managed to collect valuable leads from booth visitors who might potentially be interested in further follow-up products. This game was built using HTML5 technology and Google Chromecast. The game was created by a third party game company. 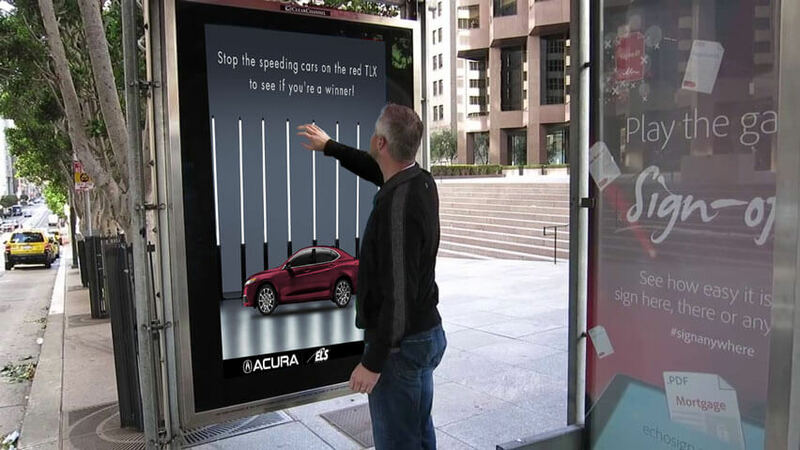 Yet another car company, Acura leveraged the power of digital signages with hand gestures powered by Microsoft Kinect. This digital signage game allows bypassers in the Acura showroom to use hand gestures to stop a flow of moving Acura cars, to find the red TLX model. Winners are then allowed to enter their details to receive follow-up prizes by the booth representatives. This game was built using HTML5 technology and Microsoft Kinect. Development was done by a 3rd party company. 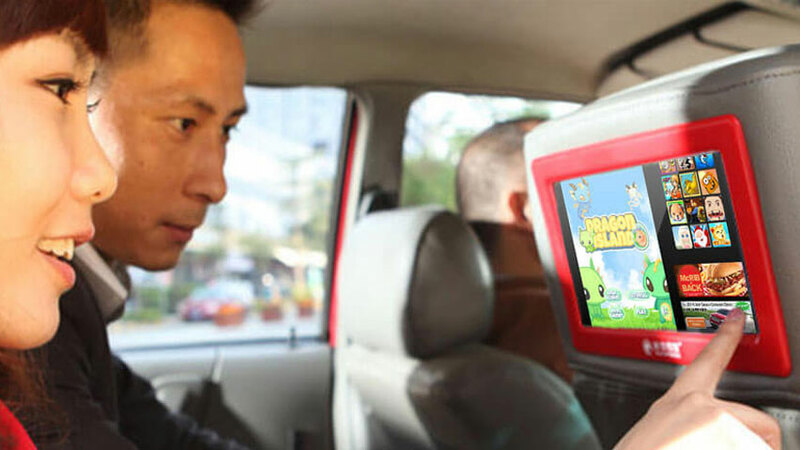 For those of you who follow the manga craze in Asia, a large manga brand called Doraemon recently promoted a game on digital signages within taxis in Asia. The game is a simple match 3 RPG battle game, where players aim to match similar characters from the brand. Upon a successful match, users see their characters dealing damage to invading robot aliens. The game was developed in HTML5 and ported into an Android APK to fit the digital signage system. East Midlands Trains (a division of UK Rail) is a train service operator based in the United Kingdom (UK). They serve over 24 million passengers per year. Recently, they launched series of casual games within their on-board entertainment system. The system consists of digital signages and devices brought by passengers. Via a local intranet, passengers are able to play the casual games while commuting to work. The game was developed in HTML5. The digital signages were prominently displayed in between train carriages. We think there's a ton of innovation happening in the space. On the user interace side, we're seeing various technologies being deployed in-tandem with the digital signage software. Through our data collection, we saw Chromecast powered games, Kinect-based gesture games, multiplayer games, augmented reality games as well as Bluetooth/RFID enabled games. In terms of content, we see a higher quality of creative ideas being converted into games. The target demographic is still casual gamers. In fact, it could be an overstatement to use the word "gamer". The goal is to give consumers an fun experience, be it rolling a dice, getting pictures taken, or participating in a really simple game to make use of the 30 seconds they have. On the game software side, we see HTML5 technology being continuously used by various brands in favor of other closed game systems. 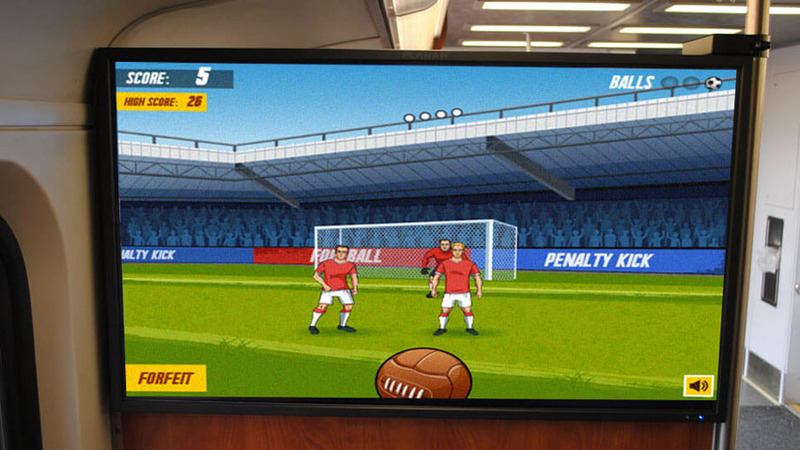 The versatility of HTML5 games is evident - they can be easily converted and optimized into Android / iOS and other digital signage compatible mediums. Geography-wise, we expect to see more digital signage games deployed in more countries around the world. We hope this article has been useful for you. Are you seeking out a developer build a digital signage game for you? Are you interested to learn more about the nature of HTML5/Android/iOS games for digital signages? Please fill in the contact form below, and our representative shall contact you shortly. Subject I need a HTML5-based digital signage game I need a custom-built digital signage game I need to rebrand an existing digital signage game I'm doing some research. Can you help me? Are you robot or human? Disclaimer: All data relating to this article is gathered from various sources. Estimates are based on sources with industry experience.